It can handle a various types of bulk materials. Various types of bucket sizes are available. Completely enclosed body prevent from dust and weather tight operation. High output capacity (3 Tph to 80 Tph) with compact size. Zero return of product on discharge side. Very tiny design with maximum capacity. Split hood for easy installation and servicing. With Inspection and cleaning port. Enough space for belt tensioning. Product nature - Free Flow etc. We are one of the leading manufacturers & exporters of Belt Type Vertical Bucket Elevator. 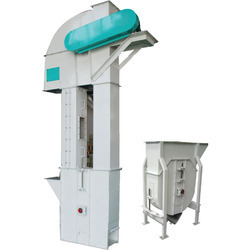 It can handle various types of bulk materials. Zero return of product on the discharge side. 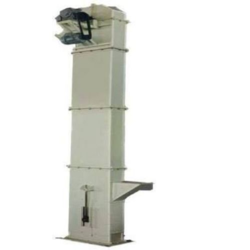 We are one of the leading manufacturers & exporters of Chain Type Vertical Bucket Elevator. Packaging Details: Wrapped or wooden packing as per requirement.